As Russian MMA legend Fedor Emelianenko prepares to make his debut in Bellator, the second biggest promotion in the US, RT Sport spoke to ex-middleweight champion Alexander Shlemenko, to get his views on his compatriot’s upcoming fight as well as the current state of mixed martial arts. 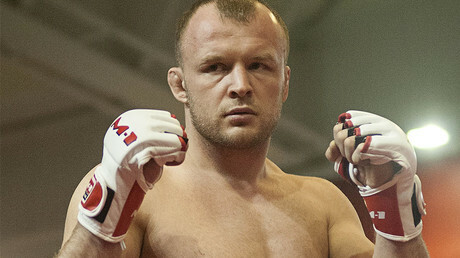 Omsk native Alexander ‘Storm’ Shlemenko began his career as a middleweight in Bellator back in 2010, paving the way for many fellow Russians into organization, including two of his students – former welterweight champion Andrey Koreshkov and Alexander ‘Tiger’ Sarnavsky, who later parted ways with the promotion. Back then, Bellator still had the Grand Prix championship system – which allowed any fighter to contest the championship belt if he or she registered enough victories. That allowed Shlemenko to fight up to four times a year in Bellator, but the restless ‘Storm’ was also fighting outside the promotion, and fought up to seven external MMA fights in 2011. “I like to fight often,” says Shlemenko. “I don’t take any time off training, even when I don’t have anything scheduled. I train six days a week. I don’t drink, smoke or do drugs. I am always in a shape, always ready. That’s why I love to fight as much as possible. With 16 Bellator bouts to his name and championship belts in his home gym – one of which belongs to Koreshkov – Shlemenko probably knows the promotion’s inner workings better than anyone in Russia. With that in mind, RT Sport asked him to give his predictions on two upcoming big fights in Bellator: Fedor Emelianenko versus Matt Mitrione, and the Chael Sonnen versus Tito Ortiz bout this weekend. “It’s hard to say, since I don’t know what kind of shape Fedor is in or what kind of camp he is having. When Fedor is well-prepared he can beat anyone, there wouldn’t be any competitors for Fedor. But it’s hard to make any predictions. Look at Sergey Kharitonov’s Bellator debut (16-second KO) – no one would have expected that. Of course I believe and hope that Fedor wins, but it’s a fight and anything can happen. “Another thing is – Matt Mitrione is a true heavyweight. Let’s be honest, Fedor hasn’t had that kind of opponent for a long time: really heavy and really good. And it’s a real test for Fedor. So it will be interesting to see how he will pass it. On Tuesday, Russian MMA promotion M-1 Challenge announced Shlemenko will fight on the M-1 Challenge 75 card in Moscow on March 3. In 2016 Shlemenko fought in M-1 twice, on both occasions defeating another former Bellator fighter, Vyacheslav Vasilevsky. Shlemenko reflected positively on his time at M-1 as well as on the current state of MMA in Russia. “MMA in Russia is developing rapidly, purses are getting bigger. In 2016, for example, the M-1 Grand Prix with just four contenders had a $50,000 prize for the winner. It’s a pretty solid amount not just in Russia, but globally. "There are more promotions that are developing in Russia too. The earnings are getting bigger which means that rivalry is intensifying. Now Russian promotions can sign better fighters from other countries, and I have to say that the level of Russian fighters is improving significantly. I’ve seen some guys that sometimes are having a hard time fighting in Russian promotions, then doing good when fighting in UFC, for example. “Also, the Russian fighters are now in a better position, than let’s say, Americans, because Russian fighters are now getting help. Sponsors and different organizations are now providing stipends for young fighters, covering expenses for training camps, and so on. We didn’t have that at the beginning of my career. “If we look at how much this sport has developed in Russia in the last 10-12 years it’s like night and day. We wouldn’t have even dreamt of seeing it on national TV. And now look – almost every single tournament is broadcast. More and more people are watching, more and more are practicing it. Although MMA is now developing quickly, Shlemenko confirms that the fighters don’t get the same level of rights protection as sportsmen do in already well-established kinds of sport. At the end of November it was announced that former Bellator boss Bjorn Rebney was among a group of MMA figures led by the legendary Georges St-Pierre that formed the MMA Athletes Association (MMAAA), which serves to protect fighters’ interests. While MMA fighters represent all kinds of backgrounds from different combat sports, a lot of people question if fighters looking to succeed in the sport should begin practicing MMA directly or gather experience in basic fighting disciplines, such as boxing or wrestling. “I think you should start with MMA directly,” Shlemenko answers assuredly. “But it all depends on the school and the coaches that are training the student. You should search and find out what the coach has achieved himself, how his students are doing. You can take that from open sources. “At the same time, different schools are using different kind of sports as their base. Some use Combat Sambo, some use freestyle wrestling, some use kickboxing. But I would suggest practicing MMA directly, because the coach will focus on all the necessary skills and remove all those you won’t need.